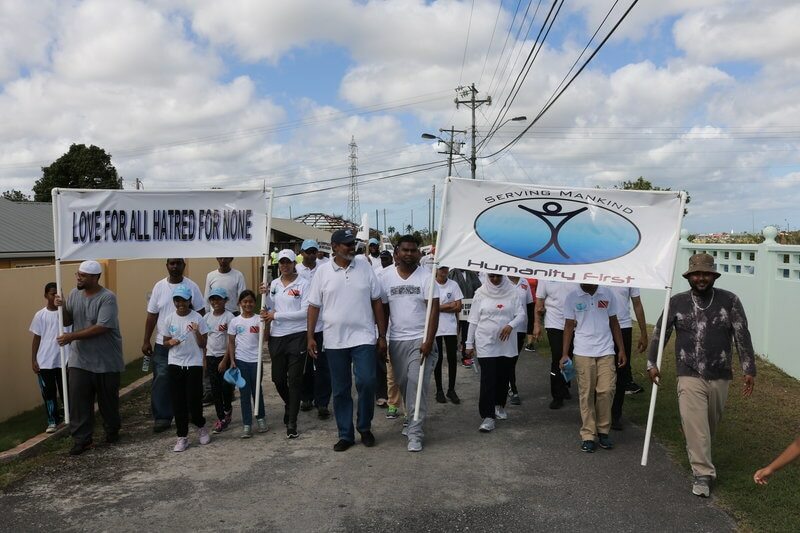 On Sunday, 27 January, the Ahmadiyya Muslim Jamaat in Trinidad and Tobago hosted its 7th Annual Peace Walk. Members from across the country began gathering at the Jamaat headquarters in Preysal at 6:30am. By the grace of Allah, over 130 members, dressed in white, participated in this five-kilometre walk. The Peace Walk is held to create awareness about the Ahmadiyya Muslim Jamaat and to clear the misconceptions regarding the true teachings of Islam. During this walk, Khuddam held banners bearing the Jamaat motto “Love for all, hatred for none” and the logo of Humanity First. Children and Lajna members waved flags with various messages of peace. As the members passed through the streets, one of the Ansar brothers presented a brief introduction of the Jamaat on a loudspeaker and invited the local community to join us on this endeavour. Local residents were curious to learn about the purpose of the Peace Walk. Many came out of their homes and stores to show their support. The Khuddam on duty were asked several questions regarding the Jamaat. Some people requested to be informed about the following year’s Peace Walk in advance so that they could also participate. Although it was difficult for senior members to walk the entire circuit, they were still given an equal opportunity to take part. For their convenience, vehicles were arranged to follow behind the walkers to ensure that they could participate to their fullest. As the members completed the Peace Walk and returned to the headquarters, they were served a delicious Trinidadian corn soup. As the day came to an end, participants got the opportunity to enjoy each other’s company and celebrate their efforts. By the grace of Allah, this was a very successful event. May Allah continue to enable Jamaat-e-Ahmadiyya to spread the true teachings of Islam and Ahmadiyyat, under the guidance of our beloved Imamaa.